BookPage reviews My Plain Jane by Cynthia Hand, Brodi Ashton, Jodi Meadows. With this crew of authors at the helm, don’t expect a simple retelling. In the opening pages of My Plain Jane, we meet not only Jane but also her friend Charlotte Brontë, both of whom are students at the infamous Lowood School. As a young aspiring author, Charlotte is working on her “Very-First-Ever-Attempt-at-a-Novel” and thinks Jane will make the perfect heroine in her story. Jane has the ability to see ghosts, which convinces the very attractive supernatural investigator Alexander Blackwood that she would make a fine addition to his Society for the Relocation of Wayward Spirits. But Jane rejects the job offer and instead sets off to fulfill her destiny by securing the governess position at Rochester’s Thornfield Hall. Off she trots with a ghostly Helen Burns at her side, who proves to be a fantastic comic foil for Jane. This book is also the first recommendation on a list of '5 Reads For Fans Of Jane Eyre' on Buzzfeed. Hypable interviews writer Brenda Clough. Inspired by Sally Bayley's memoir Girl With Dove: a Life Built by Books, The Times looks into Britain’s 'lost children'. Beyond Eden Rock posts about the book too. Heraldo (Spain) suggests 19th-century novels to read in the summer. Lo que más me sorprendió de la poesía de Emily Brontë fue su aliento pagano. Comics Kingdom asks several cartoonist about where they find their inspiration. Heathcliffing. That someone won't shut up about their ex. 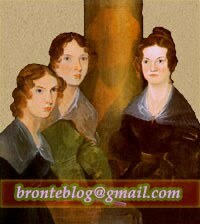 Yesterday both Brontë Babe Blog and AnneBrontë.org celebrated Branwell's birthday. Page wall post by Clayton Walker - Clayton Walker added a new photo to The Brontë Society's timeline. Short excerpt from an interview with Mia Wasikowska on the 2011 Jane Eyre - I really like what she says about the film getting Jane's age right. Jane's youth really does come through in the film.